You get error message in Feeds work center of “SAP Hybris Cloud for Customer”: You can’t access SAP Jam because configuration of your user is incomplete. Please contact your system administrator. Integration with JAM is not successful. Cannot access JAM from C4C. Failed to access JAM from C4C. One user cannot access JAM from C4C. – JAM Integration is not scoped. Communities, Document Management and External Services -> Do you want to integrate SAP JAM with your cloud solution. – JAM is scoped with a new Change Project, but this Change Project has not been merged yet. 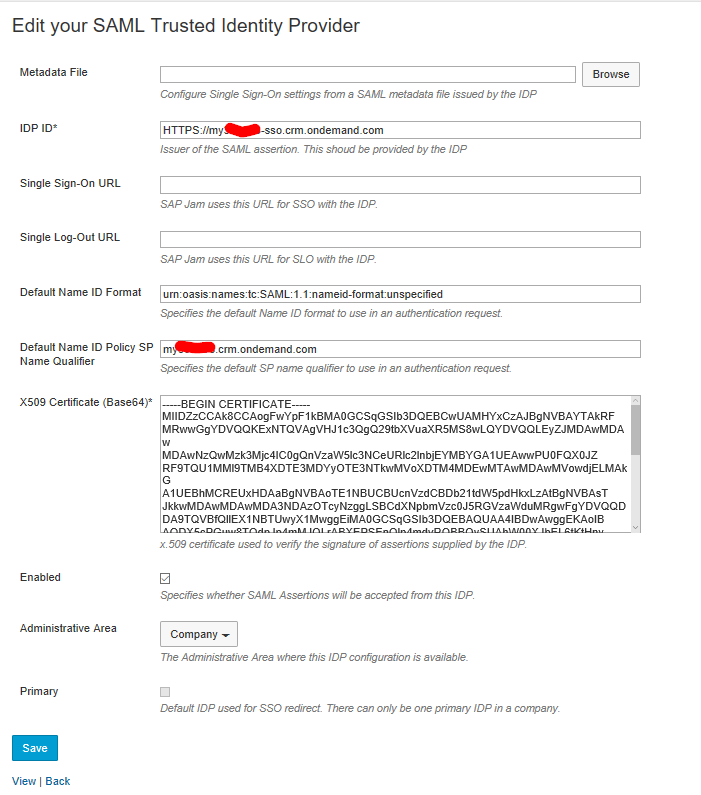 – IDP ID of JAM & C4C is not matching. You can check the Local IDP ID maintained in C4C in the Business Configuration Activity SAP JAM Integration. – Format of Authentication Server URL & API Server URL is not correct in the BC Activity SAP JAM Integration. Steps: Open BC Activity SAP JAM Integration -> Select JAM Service Provider -> Click on Register Client button to check the URLs. e.g. of incorrect format: https://jamX.sapjam.com/ (has extra ‘/’ at end). – Mismatch of Company ID maintained in JAM & C4C. Steps to check Company ID in C4C: Open BC Activity SAP JAM Integration -> Select JAM Service Provider -> Click on Register Client button -> Check for the Company ID Maintained. Steps to Check Company ID in JAM: Go to the Admin area of JAM -> Click on Compliance & Security -> Click on Security -> Check for the Company ID Maintained. – You are using E-mail address for authentication (BC Activity SAP JAM Integration -> Click on Register Client button ->Check for the Account Name Origin -> If Email has been selected). If this is the case then we need to make sure that all users on c4c side have a corresponding user on JAM side and same email id is maintained on JAM side as well. – Client ID and Client Secret are not maintained (or Incorrect) in the BC Activity SAP JAM Integration (BC Activity SAP JAM Integration -> Click on “Register Client” button). Client ID and Client Secret added in C4C should be same as maintained in JAM. In JAM Admin -> OAuth Clients -> The Key maintained here should be Client ID in C4C, and the Secret maintained in JAM should be Client Secret in C4C. – If you are using SSO to login to the JAM & it is already scoped, then make sure the SSO configuration is Active. 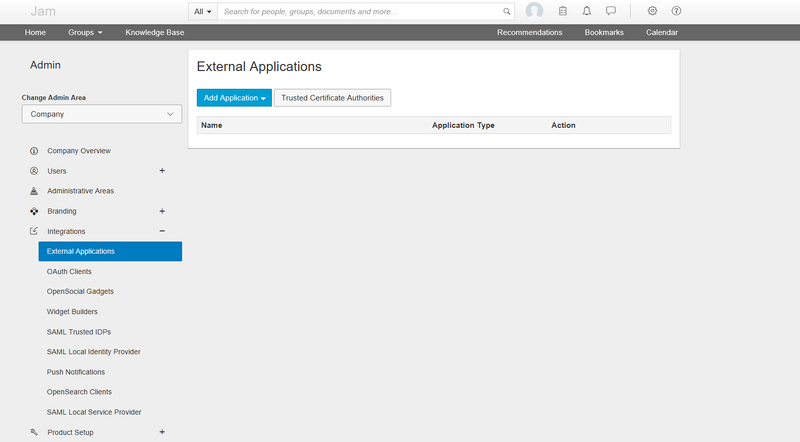 Steps: Application and User Management WoC -> Common Tasks -> Configure Single Sign-on -> Identity Provider tab -> Check if Identity Provider has been added & activated. – One user cannot access JAM from C4C. Make sure that use has authorization (Access Restriction) for JAM (e.g. Feed, CC_HOME, COD_JAMGROUP_WCV, COD_GROUP WoC & views). Make Sure that user has corresponding User in JAM. If you are using email as authentication method then the email of the user should be same in both JAM & C4C. If email is selected as authentication method, then in BC activity SAP JAM Integration, it is recommended to select “E-mail” in “Account Name” and “E-Mail Address” in “SAML NameID Format”. 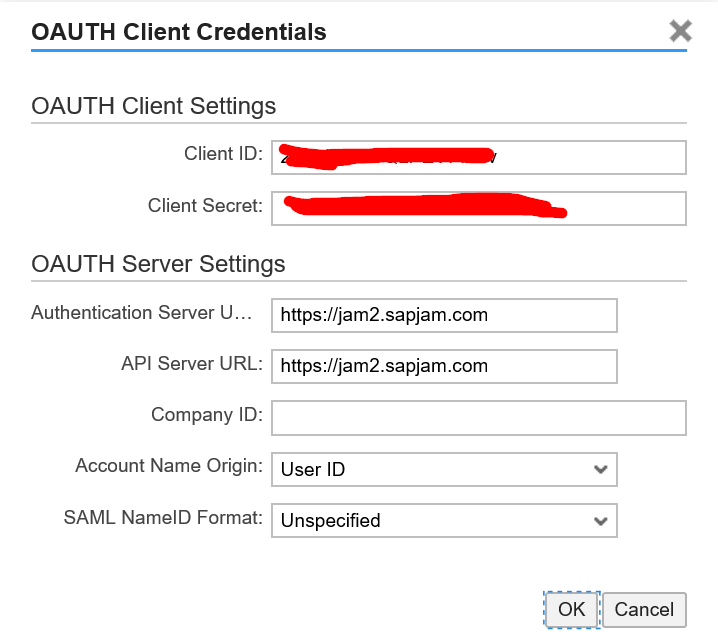 If UserID is selected as authentication method, then in BC activity SAP JAM Integration, it is recommended to select “UserID” in “Account Name” and “Unspecified” in “SAML NameID Format”. If user face the issue with access when logging in 2nd time, the issue could be with cookies; try to change cookies setting as prescribed in JAM Admin guide (Section: Configure Browser Security Settings). In Admin Area -> Click on Integrations -> oAuth Client -> select the relevant C4C client and click on View -> Capture the screenshot. In Admin Area -> Click on Integrations -> click on SAML Trusted IDPs -> Capture the screenshot. In Admin Area -> Click on Compliance & Security -> Click Security -> Capture the screenshot. In Admin Area -> Click on Users -> Click on Users & Member Lists -> Search for the user who is facing this issue -> Capture the screenshot once the search result is there on the screen. In Admin Area -> Click on Company Overview -> Capture the screenshot. ** Above screenshots are required to verify the configuration of SAP JAM. Moreover, I added a memberlist (it is an employee) at SAP JAM Collaboration but this member can’t see anything at feed. If this user is not the administrator who matches the user ID at SAP JAM and C4C I can’t see this feed. What do you think it is happening? The problem could be with IDP ID maintained in JAM (i.e. with https & SSO). Try to maintain the IDP ID in JAM & Business Configuration of C4C in myXXX.crm.ondemand.com format. IDP ID of JAM & C4C is not matching. This is what I see at sap Jam adm _> external applications. The guide does not say nothing about configuring as an external application. I do not know if this is my problem. Moreover, I do not have any company ID, but the guide says I can let it blank.